Can PDFs make you powerful? meson.press, the open access project which we just founded, has a new book out exploring my favourite subject: algorithms and artificial intelligence thereby looking into our contemporary technological minds. The book, edited by Matteo Pasquinelli, is one we are specifically proud of. All of us put a lot of work into it, which makes me ask: Why are we doing this? Of course, we think its essays are really driving the discussion of the role of digital technology forward; “advancing key debates in the humanities today” as we called it in our mission statement. And this is worth all the hassle. I am not sure, if you are familiar with the process it takes to produce a book, but I can ensure you it is long and painful (but totally worth it). Books are not like emails. They are whole worlds, and working on them requires some space in your mind-set. 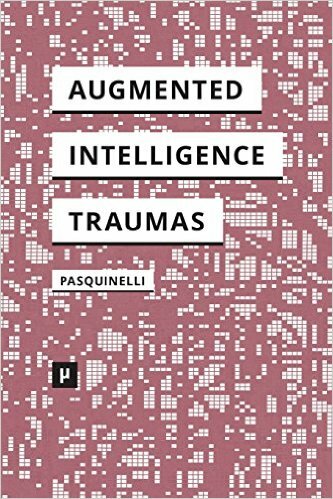 You can not come home after having taught classes at university for six hours, and then edit a highly abstract and demanding, but fascinating essay about algorithmic thought by Luciana Parisi, who is truly a philosopher of technology and a contributor in our recent book. Just so you know: meson press is a project all three of us (Andreas, Marcus and me) look after, when the work that pays our rent is finished. That we already made it this far (if I counted correctly, this is the 14th book we have published) we owe to other people; the lovely team of the Hybrid Publishing Lab (a project atLeuphana University now finished). Being able to use its research helped us a lot as did MayFly press – big thanks to you guys, especially Armin Beverungen. Having a great role model like Open Humanities Press, and being mentored by Gary Hall was also no disadvantage. Still, despite everything being digital, the to-ing and fro-ing of texts that are commented, corrected, peer-reviewed and typeset takes ages – I have listed the deadlines for a book project below. But it is all this work that also seems to change something. Thanks to the editor and with the help of the authors, the essays start to relate to each other and become a book. Like a monograph, an edited collection should always be more than a simple collection of texts. A book only appears when essays begin relate to each other. Sheer range (lots of words) start to resonate, and together those words are making the world appear differently pointing out something that has not been clearly visible before. It is this what makes the book even in its digital age as powerful as it was in its printed time. Good books disrupt the ways in which we have seen the world before. PDFs are underestimated. They can be very powerful tools. Try it here. “Alleys of Your Mind: Augmented Intelligence and its Traumas” features essays by 12 excellent authors, among them Benjamin Bratton, Orit Halpern, Adrian Lahoud, Jon Lindblom, Catherine Malabou, Reza Negarestani, Luciana Parisi, Matteo Pasquinelli, Ana Teixeira Pinto, Michael Wheeler, Charles Wolfe, and Ben Woodard. You can buy a print copy (for which we are grateful), or download the open access pdf here. In any case: please spread the word! About the book: 12 essays, 214 pages. Price for print version: UK: £14.30, US: $21.90, EUR €21.20. The digital version is open access and available for download at meson.press. How long does book publishing typically take with us? 3 months prior to publishing: author receives feedback and edits text anew. 4 weeks prior to publishing: imprimatur by the authors, the book editor and the series editors. ← Governments & technology – a productive relationship? !